Eduardo Arrocha began classes yesterday at Thomas M. Cooley Law School in Lansing, Michigan, saying he had found a new calling. 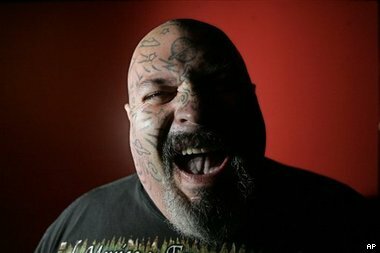 Arrocha, who has spent the last 15 years eating nails as part of a Coney Island sideshow, said it was time to move on. But Arrocha has decided to do more than just lecture about diversity. He says that he hopes to use his law degree to speak for "alternative people" like himself. "I hope to have a little office in New York," he said, "and work with the alternative people, all the so-called riffraff, to give them legal representation that is not judgmental." He continued, "I know it sounds weird, but I want to be a freak lawyer." I had been considering making that my niche, too, but I would be in serious need of some street cred if I tried to compete with this guy. So congratulations and best of luck to Eak the Geek, now faced with new challenges as he changes professions. "I’ve never had to tie a tie before," he said. I’m pretty confident that anybody who can eat nails and walk on glass can master that skill.